The message embedded in North Korea’s propaganda is summed up best in those three words. That’s what the world hears — and what’s revealed in this word cloud, a visual display of terms used by the Korean Central News Agency’s English-language service. The Associated Press condensed 1,542 stories filed between July 1 and Oct. 11 by the official North Korean news agency into a list of the 183 most frequent words. 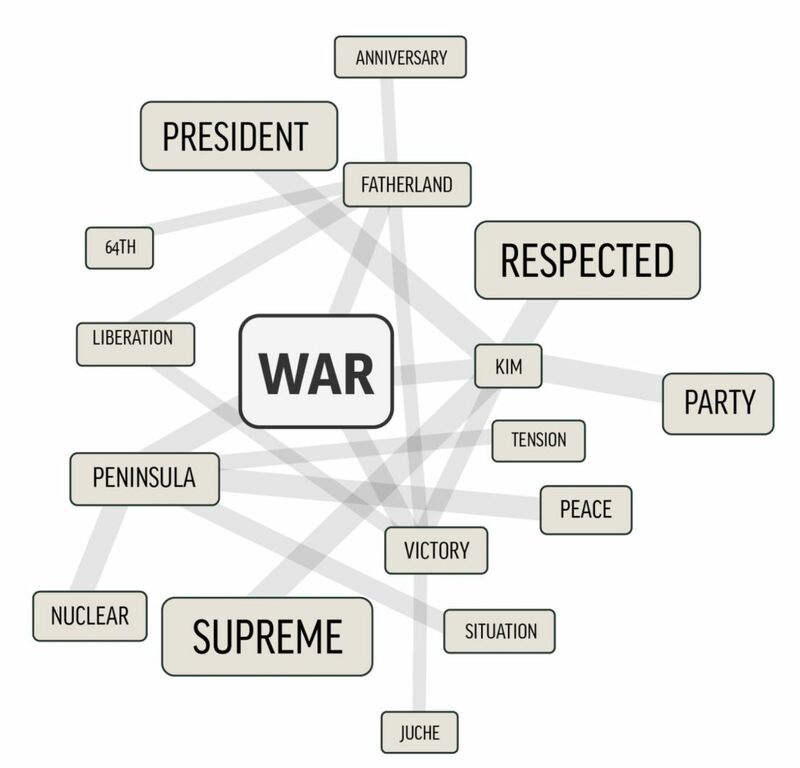 The resulting word cloud reveals some of the key patterns Pyongyang employs in its rhetorical wars with Washington. Just as important, it reflects how the government wants to be seen by the outside world. The first takeaway (no surprise) is that North Korean propagandists spend nearly all of their time hailing be-all-end-all leader Kim Jong Un. The appearance of his surname in KCNA reports 2,793 times, way more than “nuclear” at 1,671, is the predictable result of the North’s inescapable cult of personality. In contrast, the frequency of “nuclear” is telling because of the relatively narrow range of contexts in which it is used. The primary mission of the North Korean media is to chronicle Kim Jong Un’s frequent “on-the-spot-guidance” trips, the heaps of laurels he receives from foreign dignitaries, the vows of devotion from his countrymen. “War,” the third-most common word in the AP cloud, is also used not just when talking of a looming conflict with the United States but in connection with the historical one — the 1950-53 Korean War, which North Korean propaganda uses as the prime example of American imperialism and barbarism. “Nuclear,” however, is almost always used in just two ways. It’s either cited in defense of the North’s development of nuclear weapons as a just act of self-defense, or in threats that Pyongyang is willing and ready to use them to counter the “nuclear” blackmail of the United States. That it shows up so much attests to just how obsessive the North’s rhetorical defenses of its nuclear program really are. A caveat is probably in order at this point. 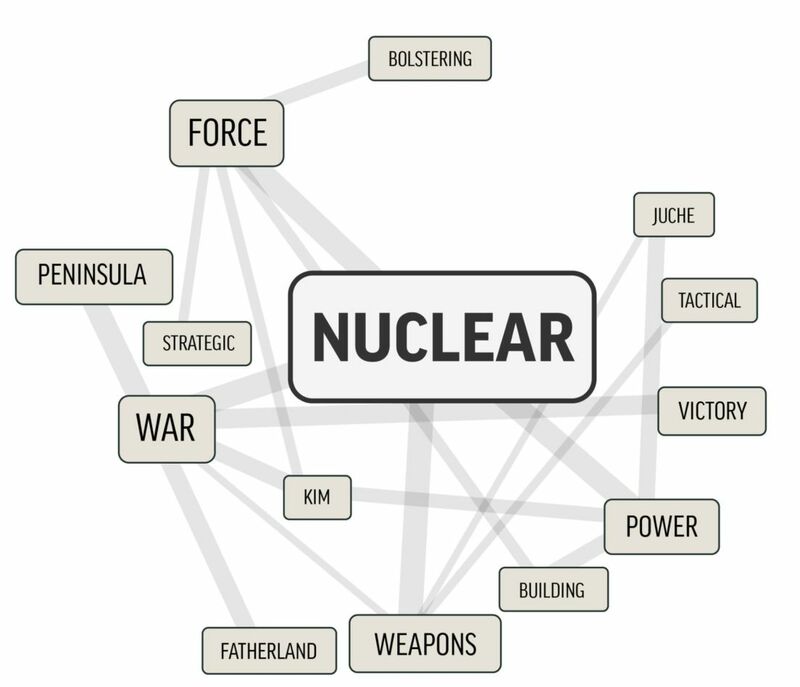 When it comes to North Korean propaganda, word clouds produce a more impressionistic than scientific picture. The best way to look at this one is like a Polaroid snapshot. It’s a little blurry around the edges and a higher resolution would certainly be helpful. But to anyone who pays close attention to politics in the North, the words do fall pretty much where expected. 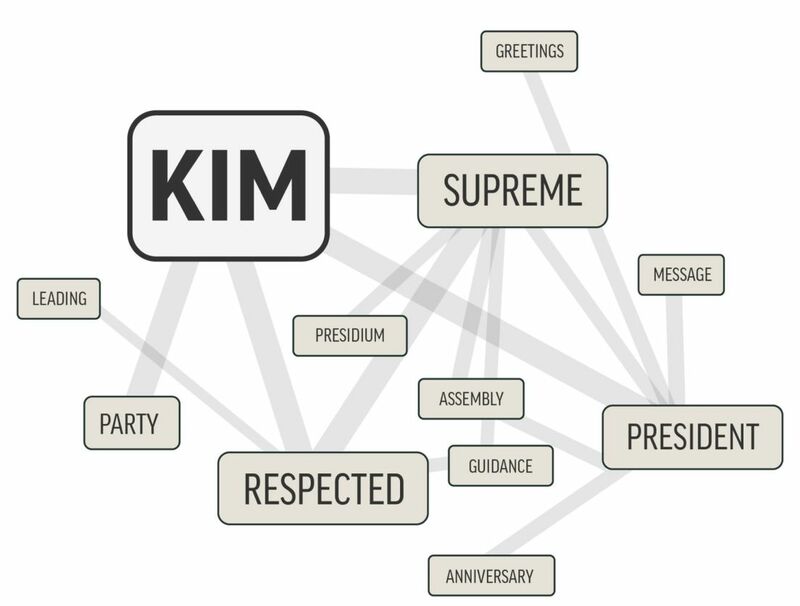 “Party” and “military,” for example, are among the top-tier nouns — they’re rendered larger than other words as a result — along with honorifics frequently used in connection to Kim and his forefathers. “Sanctions” — a major target of Pyongyang’s ire — hovers in the top 10 as well. Stories about bouquets offered at monuments to the leaders are a staple on KCNA, explaining the fairly strong showing of “floral,” and allies of the U.S. are customarily written off as “puppets,” another robust performer. Of course, this word cloud does not show every single word that KCNA used. Using a common practice called a “stoplist,” we excluded words such as “the,” an” and “whatever” for a basic reason: They were generic words that added no real meaning to the graphical representation. Other words jettisoned included basic numbers (“three,” seven”) and procedural terms whose appearance would have offered little overall insight (“government,” newspaper”). For this word cloud, countries and cities were also excluded (though it’s worth noting the U.S. was the second-most mentioned after North Korea itself). And then there are the more recent, newsy additions. ICBM — short for intercontinental ballistic missile — made 475 appearances in the more than 1,500 KCNA English-language stories between July and October that were analyzed, a period that saw the North launching missiles at a record pace. Hwasong, the name North Korea attaches to most of its long-range missiles, appeared 271 times. President Donald Trump, despite being the single-biggest villain in the North’s eyes, figures in the mix a bit less than one might expect. At 388 mentions, he falls far short of “imperialists” (454), the more generic KCNA term for Americans. “Lunatic” and “dotard,” which are emerging as KCNA’s favored adjectives for Trump, are still being broken in and haven’t established themselves enough to make the top 100 list. Trump’s locking of horns with Kim Jong Un didn’t really get going until late August, which also might account for the fewer appearances. And what of “justice,” friendship,” dignity?” When it comes to word deployment, unfortunately — but perhaps not unexpectedly — they remain relegated to the blurry fringe.